Mayor Andy Schor used Wednesday’s State of the City address to highlight development, jobs, the arts and a vision for the future. Performances from Lansing’s Above Hip Hop Academy warmed up the Riverwalk Theatre crowd and foreshadowed one of Schor’s talking points. Academy founder and CEO Ozay Moore performed and was master of ceremonies. 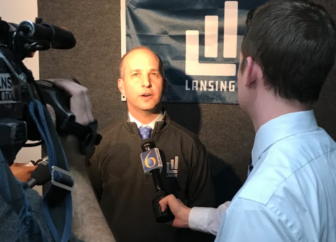 Lansing Mayor Andy Schor is interviwed at the 2019 State of the City address recapping his first year and looking ahead. Schor, a year and a month into office, talked about what he has accomplished. “In 2018, we hit the ground running. I am proud that we announced development projects, new businesses and jobs across the city. Last year, we announced nearly a billion dollars in new private investment in the city of Lansing. Lansing is booming,” said Schor. Development projects include the new Meijer grocery store, a hotel planned for East Michigan Avenue and McLaren’s new $450 million, 52-acre campus on the southeast side of Lansing. Schor also talked about his commitment to focus on developing Lansing’s art community. Later, Schor painted his vision for Lansing’s future. “Lansing will be its best self: a diverse, dense, livable and welcoming environment. Our city will offer the amenities and necessities to retain and sustain residents through all stages of life: children as they grow, young people starting careers, families putting down roots, established professionals looking to expand their businesses, and retirees,” he said. the better speeches I think I’ve heard from a politician,” said Gardin.